In Chicago, IL there is a woman who has just overcome drug addiction and homelessness. She is a single mother with a new an innovative business idea. But with very little support and community around her goals and aspirations, everyday she teeters back and forth between moving forward with her dream and relapsing. 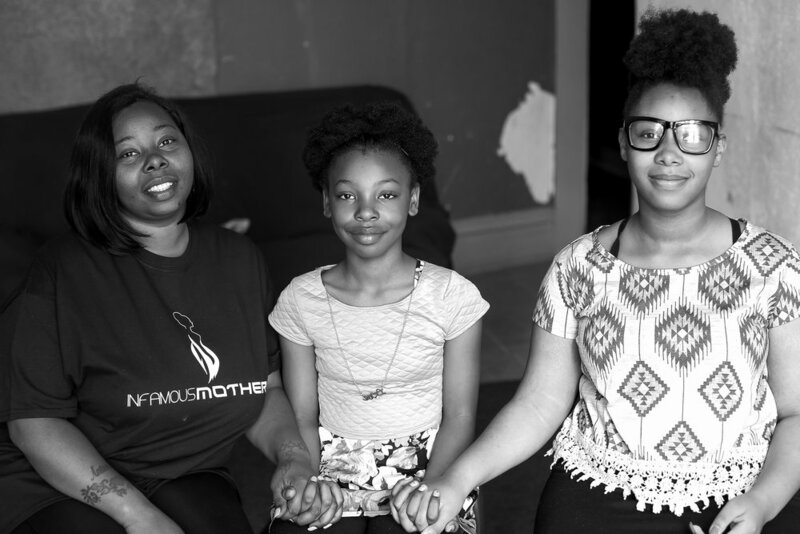 In Milwaukee, WI there is a mother who just fought her way out of human trafficking. She has three children and is interested in enrolling in school. She wants to become a lawyer, doctor or maybe even teacher so that she can save other young girls from going down a similar path. But she is first generation, broke and has no clue about where to begin. She has no family and no friends outside of her old lifestyle and is struggling to meet the demands of motherhood alone. In Kalamazoo, MI there is a woman with two advanced degrees — the first in her family to go to college. Prior to completing her programs, she danced in the adult entertainment industry. She grew up in a household under an alcoholic father and a mother with severe mental health challenges. Everyday in the workplace, she is dealing with microaggressions, the challenges of raising a child alone and feels like she is going to “snap” from the stress and uncertainty of it all. In St. Paul, Minnesota, a woman with an MBA has aspirations for an upper management position at her job. She is a young mother and first-generation college graduate. But it is difficult to pursue her dreams with very little mentoring and limited professional development opportunities. She has hit the “maternal wall” and sees no way of busting through it. In Madison, WI a stay-at-home mom is feeling trapped. She has a big beautiful home and car. She has a husband who both adores her and provides for her. And yet,she feels guilty because, as “good” as her life is, she wants more. She has dreams and goals she wants to pursue and is too ashamed to say out loud that mothering is not enough for her. Everyday, she is “faking it,” and doesn’t know how long she can continue this way. I created Infamous Mothers University (IMU) for real women like these who are on the edge of sanity and innovation everyday but have limited development, community, inspiration and self-care opportunities to thrive and become their best selves. Prior to creating IMU, I piloted our programming in cities throughout the Midwest. The response was astonishing! Women of all races and classes are hungry for our message. They are excited about the community and platform we are building. To keep make this work sustainable, we are reaching out to a small number of people asking them to sponsor one of two things. First, we are asking for support to cover the initial startup costs of IMU. These include the first year’s cost of our learning platform and other technology, vendor’s fees and supplies (folders, pens, journals, etc). Second, we are looking for support to cover initial scholarships for early adopters who cannot afford programming on their own. I am looking for 10 people who are willing and able to sponsor $10,000 and five people who are willing and able to sponsor $20,000 to help us reach a goal of $200,000 by April 23rd, the third anniversary of the photo shoot that brought our original 20 women together. Beginning April 12th, we are soft launching IMU in 14 cities throughout the US. Infamous Mothers has a proven track record of fulfilling its promise to the community. To produce the coffee-table book titled Infamous Mothers: Women Who’ve Gone through the Belly of Hell and Brought Something Good Back, we raised $25,000 through a Kickstarter campaign in July 2016 (https://www.kickstarter.com/projects/infamousmothers/infamous-mothers-chicago-a-coffee-table-book ). In October 2017, the book was published (see book and reviews on Amazon). We promised a tour that would pilot programming to women in multiple cities. Traveling throughout Wisconsin, Illinois, Minnesota and Ohio, we made good on that promise in the summer of 2017. We promised an Infamous Mothers play. On November 8, 2018, we sold out a 10-show run on opening night. We added an 11th show, selling out within the hour. Regarding IMU, we promise a robust, sophisticated and cutting edge hub for mothers from all walks of life that will inspire them to build mothering practices that include their truths and humanity at the center.